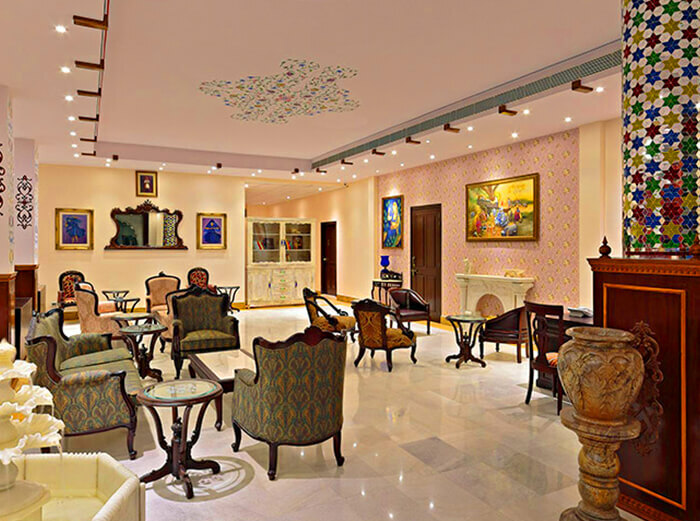 The ’Pink City’ of Jaipur, as the capital of the desert state of Rajasthan is commonly known, symbolises the royalty of the Rajputana Empire and, the hotel takes the guest on a royal journey. The pink city of Jaipur is symbolised by the royalty of the Rajputana Empire and their ruling in India. Ensuring to take its guests through the royal journey of the Rajput’s both through service and stay, Talaibagh Palace celebrates the spirit of Rajput palaces in the modern idiom. Rao Bikaji was the founder of Bikaner which was the erstwhile state in Marwar Region. His Great Grand son Maharaj Kishan Singh ji (the youngest son of Maharaja Rai Singh ji and also the general of Emperor Akbar courtship) got the lordship of 280 villages, whose then prevailing last landlord was Thakur Dunger Singh till 1945 since zamindari was abolished in 1947. His Grandson Thakur Jaideep Singh Bika is the owner of Talai Bagh Palace. The famous block printing and the tie and die form of prints, a speciality of Rajasthan are the inspiration for the textiles at Talaibagh Palace. Talaibagh Palace, thus, reflects everything that is splendid about Rajasthan and all that is unique about Talaibagh Palace. ‘Talaibagh’ - a perfect description of royal architecture where the marble water body in the backdrop is paired with Indian and western bands to set a perfect environment for a royal evening that you can look forward to.